No debate, no amendments, no transparency. But Lindsey (“shut up you don’t get a lawyer”) Graham, criticizes Rand Paul for being out of touch with security needs. 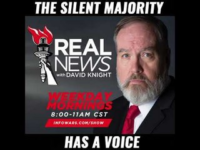 David Knight exposes the bipartisan Bluegrass-Broadway pork projects McConnell & Schumer put in and why the budget has to be hidden like everything else done in DC.